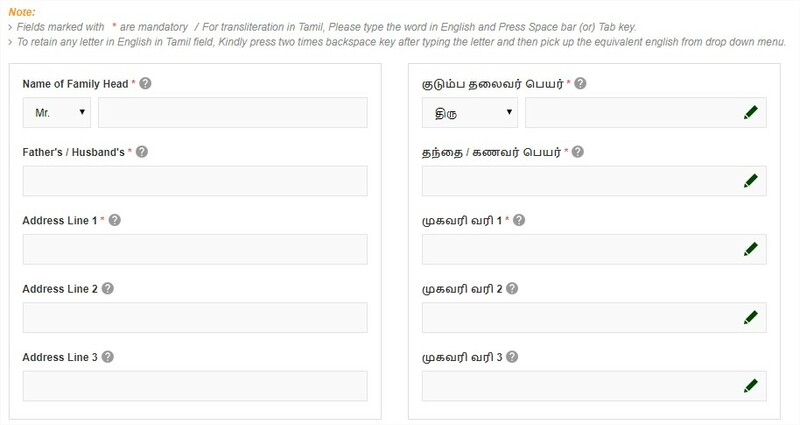 TNEPDS – Tamil Nadu smart ration card online. Now, you can apply for smart ration card online in Tamil Nadu with the help of the TNEPDS website. TNPDS is an official website where we can make correction changes, and add family members as well. Here we cover the process of applying new Tamil nadu ration card and complete step by step information to track the status of tamil nadu smart card online here. Once after entering the TNPDS/TNEPDS official portal look for “Smart Card Services” on the home page and then click the “smart card application” to redirect to the Application form. Note: Make sure to fill out all the required details on Application Form. In case if you need any assistance please do leave a comment here at the end of the post we do help you out. If the application form will not load, then please do refresh the home page of TNPDS website or TNEPDS whatever. Then you have to fill in the details in the TNEPDS application form. The details are listed below. Then followed by the “Details of the family members“. The details including the member Name, gender, Date of birth, Relationship, and Action are to be filled on TNEPDS Application form online. These details can be corrected on Ration card later. Fill with appropriate details with no mistakes so that to avoid the wasting of time to modify the current ration card. Then move to the “Card Option” column and select one option from the list of TNEPDS card options consisting of No Commodity card, Rice card, Sugar card and others. On moving further in filling the TNPDS application form you have to select the type of document you are attaching to the form as a Proof of Residence. Anyone of the below-listed cards can provide them as proof documents. Upload the scanned or soft copy of the document in the form itself. At last, don’t forget to attach a proper photograph of the applicant which should have a file size of less than 2MB. Click the “submit” button at the bottom of the application form. After the submission, you will be given a tracking number which will be used to track your application status. When you applied for the TNEPDS smart ration card you will be given a Reference number after your application submission. Make sure to not down that number in order to track the smart ration status from the TNEPDS official website. By using that reference number you will be able to track the status of your application on the homepage of the TNDPS online website. Go to the website https://tndps.gov.in and click on the “Smart Card Services” section on the homepage. Then you will be redirected to a page where you have to enter the Reference number you had within the column and then click “Submit” to know the status of your application. If you are not given any reference number during the submission then you must be received it via SMS to your registered mobile number. The TNEPDS always provides helpline services to the applicants in case of any queries or doubts. In case if you are not satisfied with the services you can lodge a complaint on it online through TNPDS online website which is mentioned above. If you have any queries regarding the status of your application you can also register a complaint through the message via registered mobile number i.e PDS<space>107 to 9980904040. Or you can also give a customer feedback in the “Customer Feedback” section on the Homepage or click here to go to the feedback page. You will receive an OTP to our registered mobile number which should be entered on the page to login to your account. Then click on “Smart card details edit” on your Left-hand side. After all this process you will get an SMS regarding the Smart Ration Card which should be collected in the distribution center near to you.Or you can print your New Smart Ration Card instantly at your nearest e-Seva office without visiting any TNEPDS offical website.